I realise I have not done any scientific posts of late so I will redeem myself and answer Courtney's question on why exactly pH does not affect hair.......tomorrow (lol!). I have an insular life where I think that the modern new products produced by black companies are the norm, sometimes I have to remind myself that being active on the internet is what opened my eyes. Still I wonder, why oh why do we still do this white product, black product stuff? Is it so wrong that I wanted to morph into Darth Vader and zap the products off the shelf? Seriously, how can one person be so bothered about someone else's hair? Why the outward focus, why not focus that energy inward and promote your own aesthetic? Why rely on someone else, why not be your own role model? There are so many 'natural hair gurus' some who had this status bestowed upon them others who self proclaim it. Ultimately my opinion is that we need to stop idolising people and get busy loving our own hair. I am personally a natural till I die person but I would not want to hold someone else to my ethos. Operative word - MY. Aww K that is sweet. I wouldn't help with the actual process myself but I would look out for her and make sure she had the best advice possible. Jc, you hit on 2 issues that really drive me up the wall. I can't decide which one bothers me more, but I think it's the natural vs. relaxed conflict. 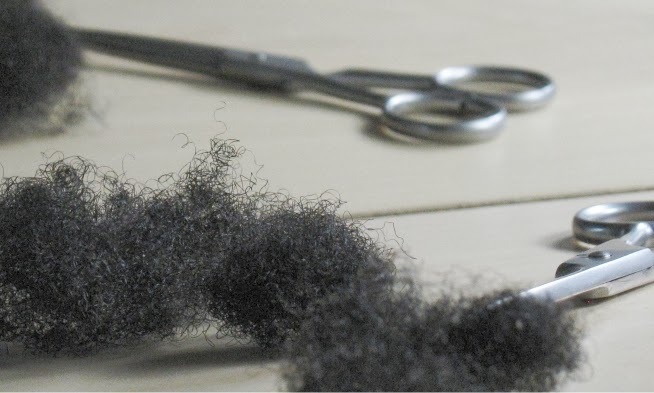 The one thing that unites the online hair community (whether relaxed or natural) is that each woman had a light bulb moment one day and googled "natural hair" or "African American hair" or "caring for a relaxer", etc. There are thousands of women struggling with their hair that either have never gotten that light bulb or were too overwhelmed by their search results to continue exploring. We're together in this community and we should be helping and learning from each other, not judging each others personal decisions! I know we can do better than that. I think readers feel strongly about what a blogger does to their hair because THEY'RE invested in it too. Especially if they've been reading from the beginning and have followed your ups and downs and provided comfort and insight when they could. White product/black product: I agree, that is so silly. I am as white as the driven snow and I love love love your blog! FYI my hair is 2b/c/3a (depending on its mood and the weather), fine, porous and frizz prone. I have learned so much here (loved the deep conditioning panel), thank you so much! "Betrayer" LOL!! This was going to happen eventually. It's hard enough to stay natural when family, friends and hair dressers tell you straight relaxed hair is the way to go. Natural hair sites have become like sisterhoods, when someone falls off the wagon some people are disappointed. It's like an addiction for some, like K said, calling your name. Little One - I totally agree, when someone decides to make a personal decision, we need to live and let live. Alice - I also agree about the passion that people have about online personas. I think a lot of people managed to express their disappointment in a measured way. All of this is acceptable to me frankly if you set up a site and people flock to it don't expect them not to be miffed when you change tune. I just think it crosses the line when people begin to make illogical insults like 'traitor'. The women I saw did not declare that they would be natural forever, the audience made that assumption. B- Thanks! lol@white as the driven snow. Ultimately good hair practices don't come with a colour label. I totally feel your red eye about 'black products' and I think the problem lies in the myth that black hair is drastically different from every other type of hair and thus requires 'special' products. I wish people would focus on ingredients rather than the colour of the woman on the packaging. As long as our local hair shops sell rubbish and we buy it, big retailers like Boots and Superdrugs have no reason to do any differently. I can understand a person feeling betrayed by someone who was a natural, maybe even their natural hair inspiration, who relaxes their hair. Especially if they were a natural hair blogger or something beforehand. The product issue bothers me. Every time I'm at the drugstore, I wander over to the black hair care section to see if anything has changed. It hasn't yet. That two feet of shelf space is always packed with water/petrolatum/mineral oil products, scary-looking gel, and relaxers. At least in the US, Target is trying by now carrying some great natural products made by black-owned companies. Hopefully, it will be profitable and it will encourage other chains to change the products that sit on their shelves. I applaud both of those bloggers for doing what they want with their hair, and then putting it out there knowing they would likely get blasted by some for it. We do take our online hair role models seriously; for many people, the only natural hair community available is the one online. I love your blog and your hair (without idolizing lol) and you have been really helpful to me the past 2 months Thank you for this post!! I totally agree about the "ethnic" care section. Nothing but crap products in a dusty 2-foot shelf space. Black beauty supply stores aren't much better...you can feel "lucky" that you now find whole isles of that mineral oil laden stuff...no black owned or natural product lines in sight. It's a shame. JC, I think a lot of women who buy this products are unaware that they do more harm than good. I have been natural just about one year but I had no idea that this is possible. I only happened to come across the "natural community" online.I can't for the life of me remember how this happened but I now know better. I can bet my life on it that a number of black women would also change their practices if only they had the knowledge. I'm from the UK as well. lol Kadiane! You are too funny. I have not put up any photos of myself on the web. Breezy is referring to my natural hair. So to make this long rant short, as a white girl, I feel I need to take a stand for the products in the "black aisle" ;D !!! But of course this colour divide is obviously silly. We shouldn't let our hair divide us I love my natural hair and it will stay with me until I die but if someone has natural and decides to (stupidly) relax I'm just going to let them get on with it. I have to just continue to be the very best version of me. Oh and I hear ya on the products thing, I remember when I thought that the black products were specially formulated for our hair, now I just realise they are specially formulated full of junk! I love my Natural hair so much I named her. (lol) As much as I enjoy being part of the Natural Hair Movement, I have no ill will toward anyone who wants to relax/texlax their hair. And as for the "ethnic" section, I don't even go down that aisle. I wouldn't touch that stuff with a stick.